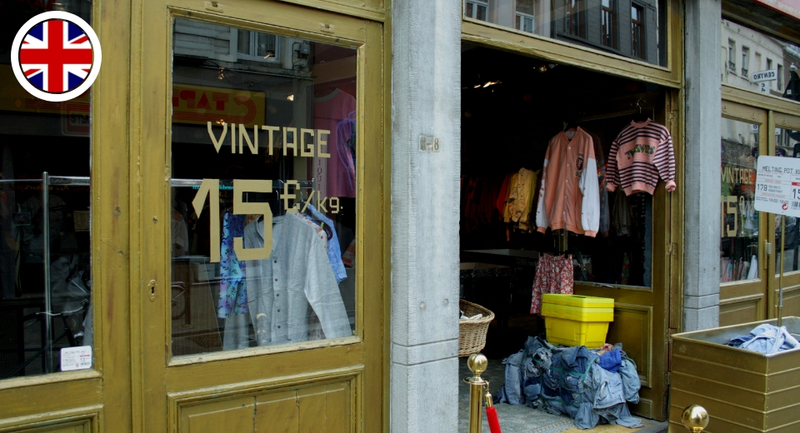 Brussels has become one of the top destinations for vintage shopping, especially on a Sunday. 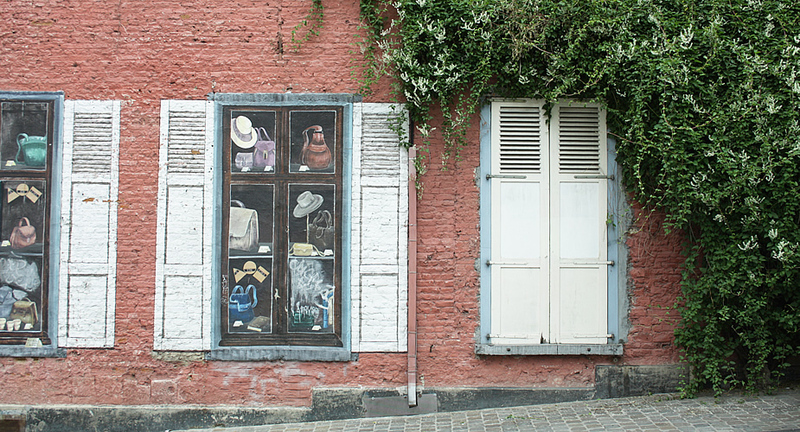 Head to The Marolles and discover some of the best vintage shops Belgium has to offer, get lost at the biggest flea market in Europe, go antiquing and treat yourself to a well deserved Belgian beer afterwards. 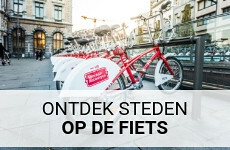 Here’s my guide for shopping in Brussels, on a Sunday (or any day). The Marolles district is situated a little north of the city centre, in the shadow of the grand law court. The area was named after the religious order of the sisters maricolles (apostolines) which was present in the district in the 17th century. Throughout the centuries The Marolles was always the neighbourhood of the poor and it was the place where people would go to pawn their belongings or buy second-hand goods. 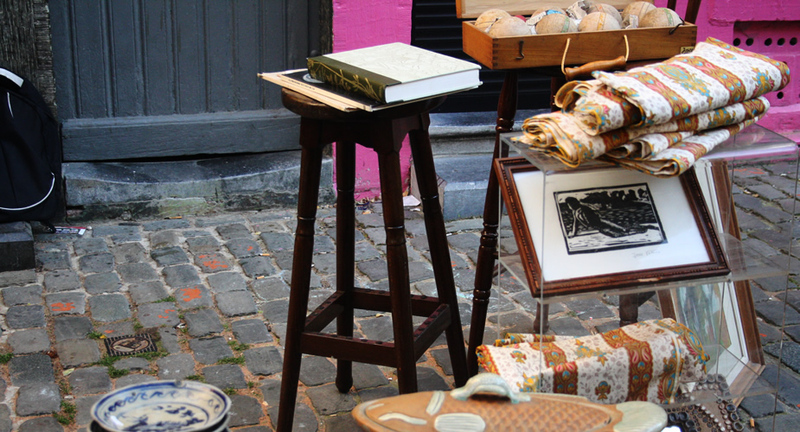 And while the neighbourhood definitely cleaned up over the last few decades, The Marolles is still where you’ll find the best vintage and antiques in Brussels. Now, while it’s always a good idea to visit this neighbourhood, I suggest you go there on a Sunday. Why? Well, because on Sunday a lot of things in Brussels are closed: shops, cafés and restaurants. So if you decide to linger in the heart of town, you may be in for a disappointment. But if you head for The Marolles, you won’t regret it for a moment. I promise. A good place to start your discovery of the neighbourhood is actually above it, on the Place Poelart. The giant square lined by the Palais de Justice is the best lookout point of Brussels. You can see the entire city centre, impressive Koekelberg Basilica and famous Atomium glistening in the far distance. Hop on the elevator, head down and you’ll immediately find yourself in the heart of The Marolles. And that’s where the shopping begins! Rue Haute is bursting at the seams with vintage shops. You either buy it per piece or by the kilo. For the latter Melting Pot Kilo is the place to shop: piles and piles of vintage jeans, dresses, jackets and bags. And all for just €15 a kilo. 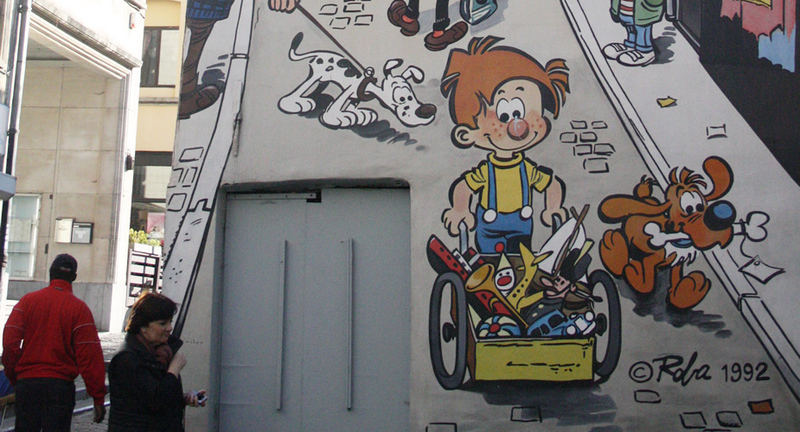 Don’t forget to look up every once in a while in Rue Haute and the surrounding streets as you may discover some of the great mural cartoons that Brussels is famous for. Just around the corner, after you’ve visited vintage shop Foxhole and craft shop Atchoum in Rue des Renards, you’ll stumble upon one of the oldest and largest daily flea markets in Europe at Place du Jeu de balle. For over a hundred years neighbourhood residents have been coming here to buy and sell second hand good. You can literally find anything on Place du Jeu de balle: clothes, kitchenware, furniture, jewellery and art (well, make that kitsch). Make sure you won’t get there too late as most salespeople will start to leave at around 1 pm. Shopping in Brussels: a 1940’s carousel, anyone? Are you looking for an aeroplane model from the turn of the century, a gramophone or two or maybe a carousel from the 1940’s with the original horses? I have seen them all on Rue Blaes, so that’s obviously the best street for antiquing. 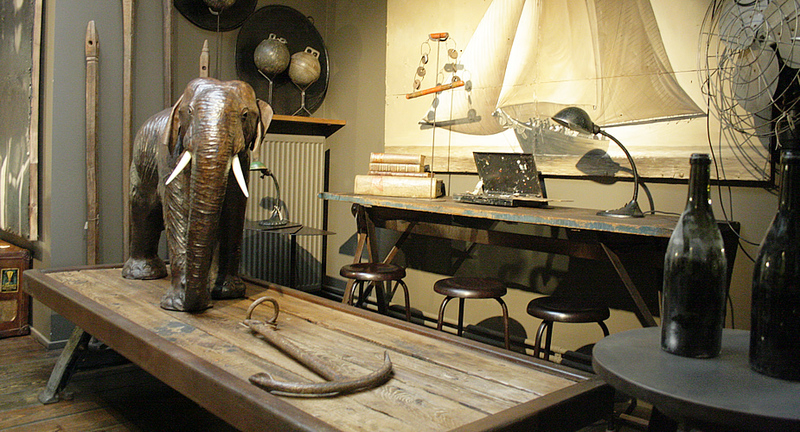 KLoan is filled top to bottom with beautiful industrial furniture and antique decorations. I especially loved all the table and glassware. When entering Stef Antiek it’s like you just walked into Alibaba’s cave, crammed with Louis Philippe chairs, silver and brass lamps, a 1940’s carousel, crystal chandeliers and small trinkets. After all that browsing and shopping, it’s definitely time for a well-deserved drink. And Belgium wouldn’t be Belgium is there wasn’t quite a number of typical watering holes on every street corner. 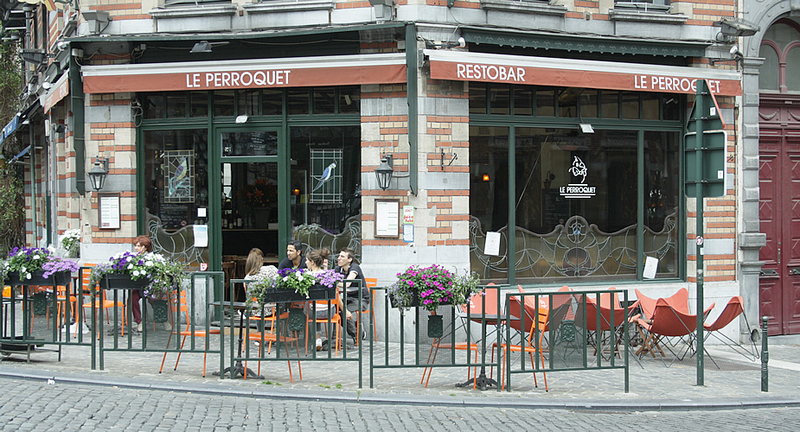 But let’s keep things vintage, so I propose you go and have a drink at Le Peroquet. 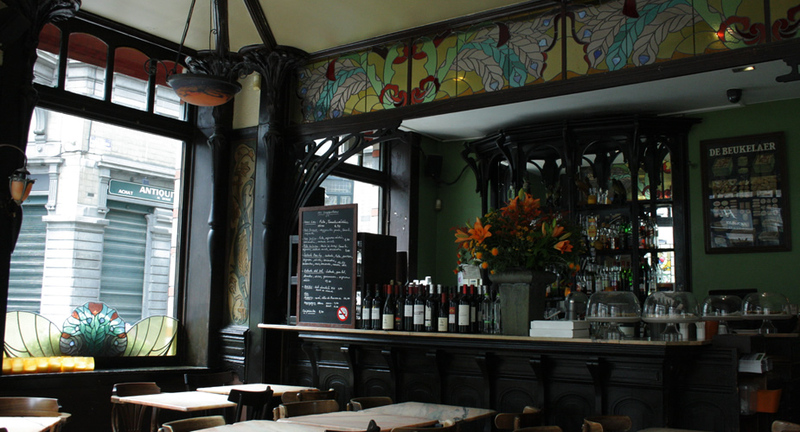 This café is one of my favourites in Brussels, for a number of reasons. First of all, the splendid Art Nouveau interior which will make you dream about flapper dresses, the Great Gatsby and Brylcreem. Add to that the friendly staff, the simple, but fine, menu and the fact that mostly locals come there for their daily beer or two and you’ll be ordering another glass yourself. If it’s a little too early in the day for beers (but in Belgium, when exactly is that?) 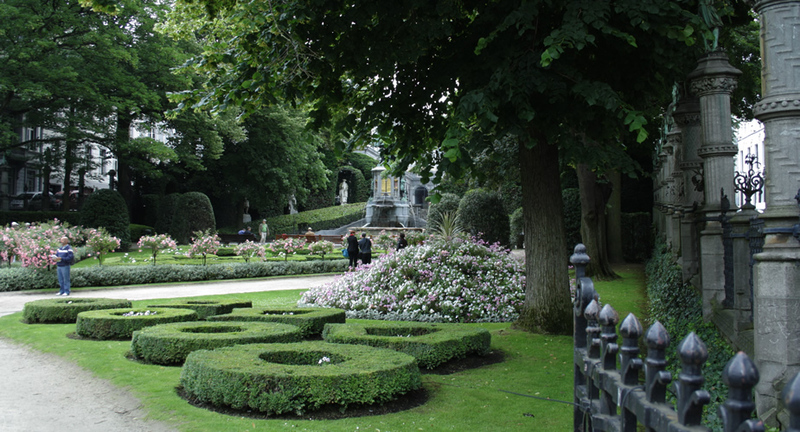 I recommend walking over to Le Petit Sablon, my favorite spot in Brussels. This cute, little park has an impressive fountain in the middle and is lined with bronze statues of the old guild members of the neighbourhood. Before you plump down on one of the parks benches, pop by the nearby Le Pain Quotidien for a coffee to go and a pain au chocolat and let the people watching commence. Wallpaper in bright graphic prints, 1970’s chairs, a cosy lobby and a little garden terrace. When I was looking for a nice place to stay in Brussels, I just couldn’t resist the Vintage Hotel. The hotel is tucked away behind the majestic Louize Avenue with all its high-end shops and eateries, and it just has the perfect location for exploring Brussels. In walking distance of the St. Gilles neighbourhood with the beautiful art nouveau treasures of Horta and Hannon, close to The Marolles and only two metro stops away from the city centre. The rooms of Vintage Hotel are completely dedicated to the 70’s with bold and bright graphic prints and wallpaper, fluffy cushions, fun gadgets, retro lamps and vintage furniture. The only brand new things are the beds, bathrooms and flatscreen televisions. Since my room was located on the top floor I had a nice view of the neighbourhood and things were nice and quiet. Also, I immensely enjoyed the extensive and scrumptious breakfast in the bright and retro dining room, a perfect start for another day of vintage treasure hunting. 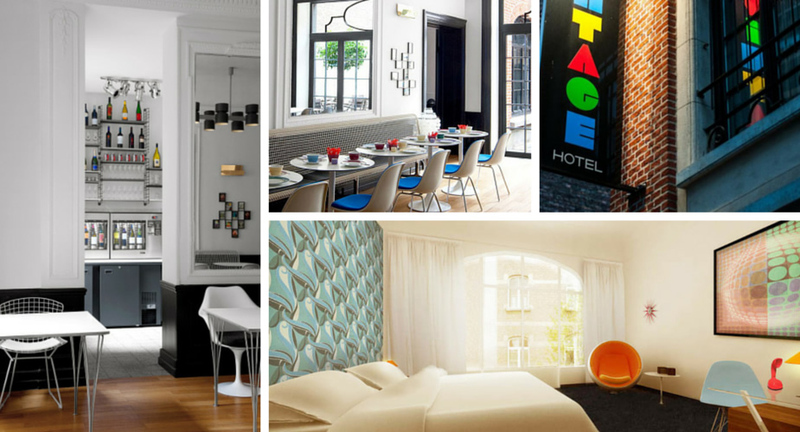 You can stay at Vintage Hotel for €75 a night, including breakfast. 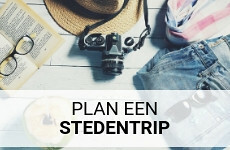 If you love Belgium (and why wouldn’t you), also check out my article about the best things to do in Ghent and Bruges. 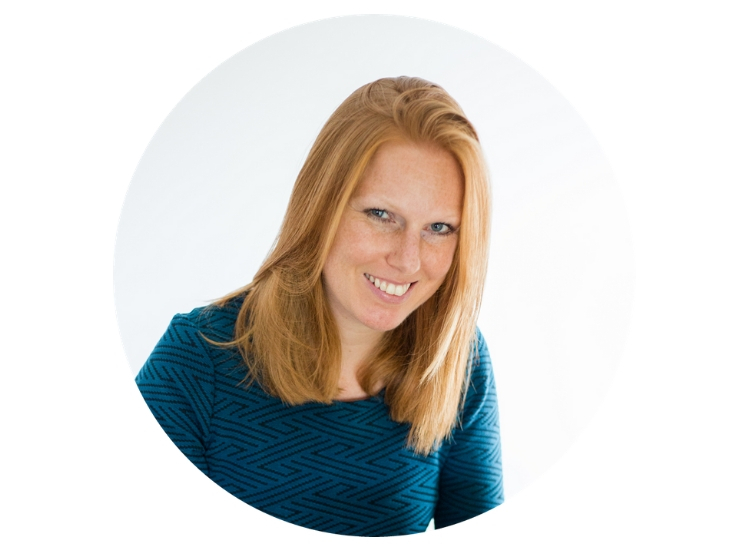 You can also take a look at my other English articles. Were you ever in Brussels? What did you like best? Love your photos and descriptions, I felt like I was there! 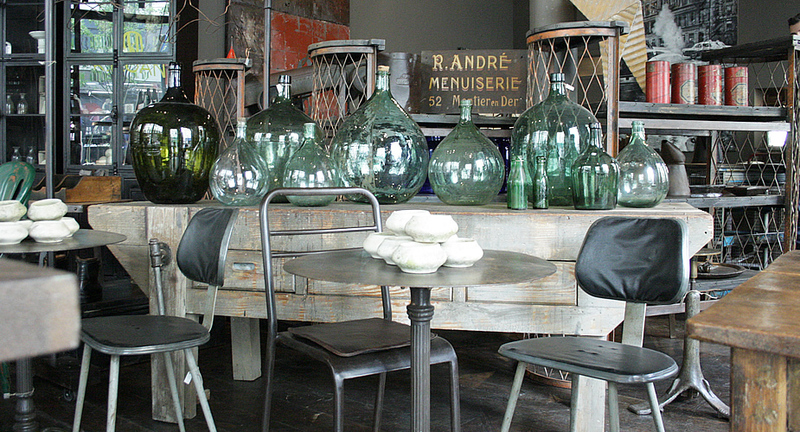 I love vintage and antiques… when I finally visit Brussels I will make sure to stop by The Marolles. I’ve not yet been to Brussels but you’ve just persuaded me exactly why I should. I love the idea of rummaging through the stalls in the antiques market and that café looks wonderful. Love Brussels! I made a stopover there last October and managed to get to the flea market. Great place to get some serious bargains! Also really into the buying by the kilo idea. Came across a store that does that in Athens (where I was coming from on the way to Brussels, actually). Need to check out more of those stores. Often that’s where you find the most authentic souvenirs for the best price! Vintage shopping and flea markets are my favourite pastimes for weekends. 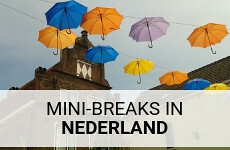 I almost died of happiness in Amsterdam and I hoped it would be the same in Brussels, but then – there was a general strike and I got stuck at the suburbs of the city, bad luck! This sounds incredible. 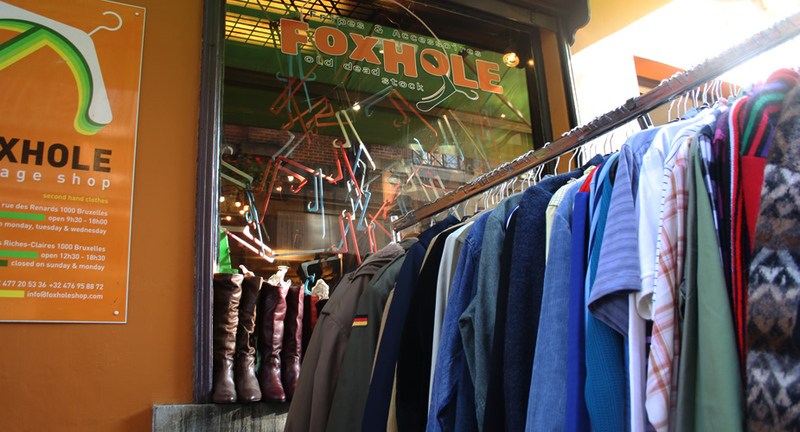 I do love some vintage shopping, and it’s another great side to the city to explore.